For several months now I've been following a website called The Burning House, which, by way of inviting people to make their own submissions, documents the precious items people would try and save if their house or apartment caught fire. I haven't submitted my own yet because every time I think I've got a handle on what I'd bring with me, something changes my mind. But, in an effort to produce a draft (at the very least), I picked out some objects. - Handbound book by Tony (features pages from The New York Times). - My first juggling balls. - Necklace from my mother featuring St. Paul, patron saint of reporters. - Altoids from my dad (note says: "Just remembering -Dad." 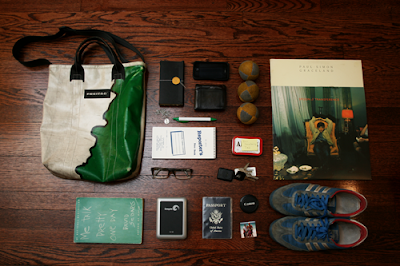 - Favorite band: Spoon | "Tranference"
- Favorite album: Paul Simon | "Graceland"
- External hard drive for music/photos. - Picture of my family. Again, this is a work in progress. I think I'm getting close to something, though. ..sort of the George Costanza approach to fire, I guess? I'm not married, Kyle. And I recently decided to forgo purchasing a dog in order to save up for a Playstation. Also: I really struggled when it came to deciding whether or not to bring my Seinfeld collection along with me. At least take The Puffy Shirt toy. And now that I look at the website, I realize the practicality of the items doesn't matter as much as the content. I should have checked out the site earlier, there's some pretty interesting ideas on there (although a few of the people's selections seem a bit same-y).